I have 2 of these and they are great. Well made and comfortable. I found both for around 180.00, can’t beat the price for a quality product. Muddy support is second to none. They will help you any way they can. Thanks for a great product! The padded shooting rail flips up and out of the way, a handy feature for bowhunters. The large, bench-style seat has two individual seat cushions and a removable backrest. Three single-rail ladder sections make for easy transport. Muddy’s The Nexus Ladder Stand proves the ultimate in quiet, comfortable hunting. Adjustable 1″-thick padded shooting rail on the roomy two-person treestand delivers a sturdy gun rest that can be easily flipped back for a clear bow shot. 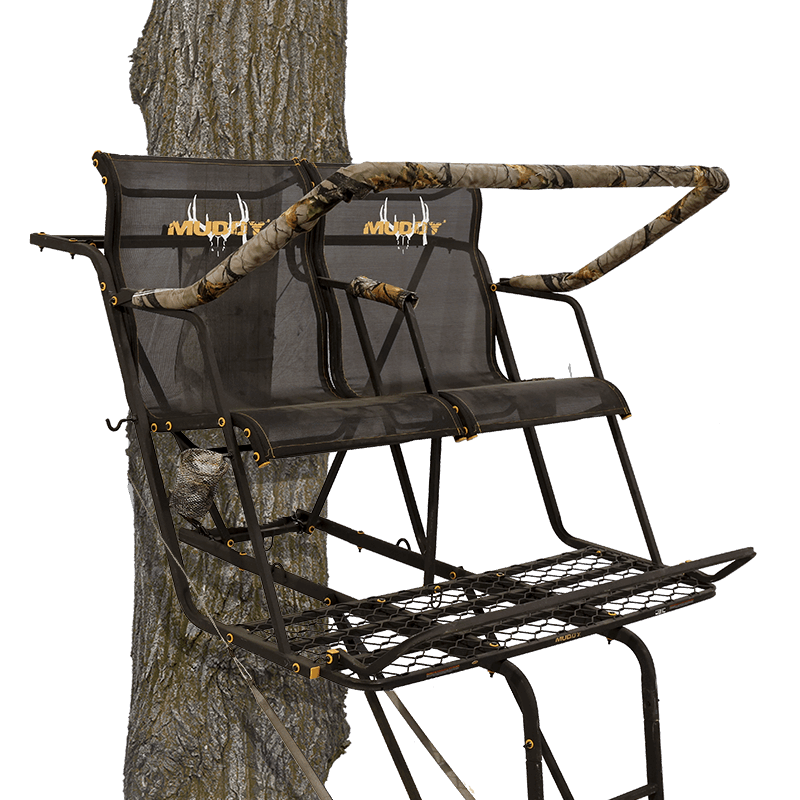 Muddy’s The Nexus XLT Ladder Stand not only proves to be the ultimate in quiet, comfortable hunting, it’s bench-style seat is big enough for two hunters. Adjustable 1″-thick padded shooting rail on the spacious two-person treestand delivers a sturdy gun rest that can be easily flipped back for a clear bow shot. Sturdy Fiber Guard powder-coated steel combines with the expanded D-force metal platform, adjustable support bar and three single rail bolted ladder sections to create a rock-solid stand. 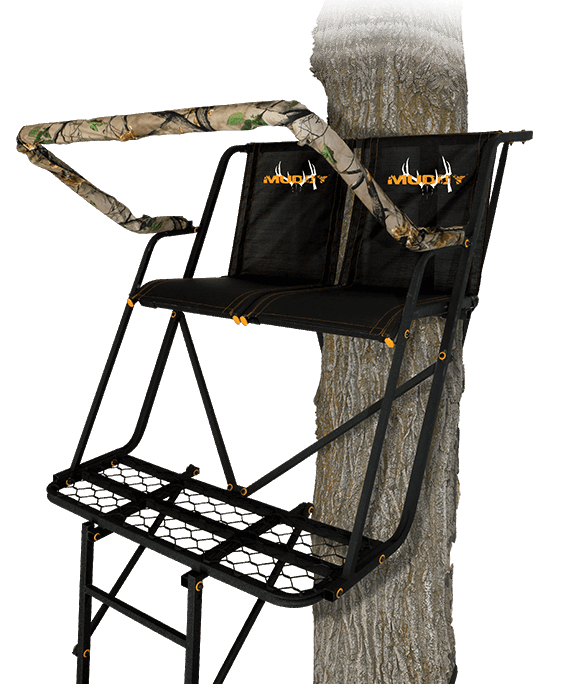 Flex-Tek Zero-Gravity seat and padded armrests allow you to sit motionless while waiting for your prey. 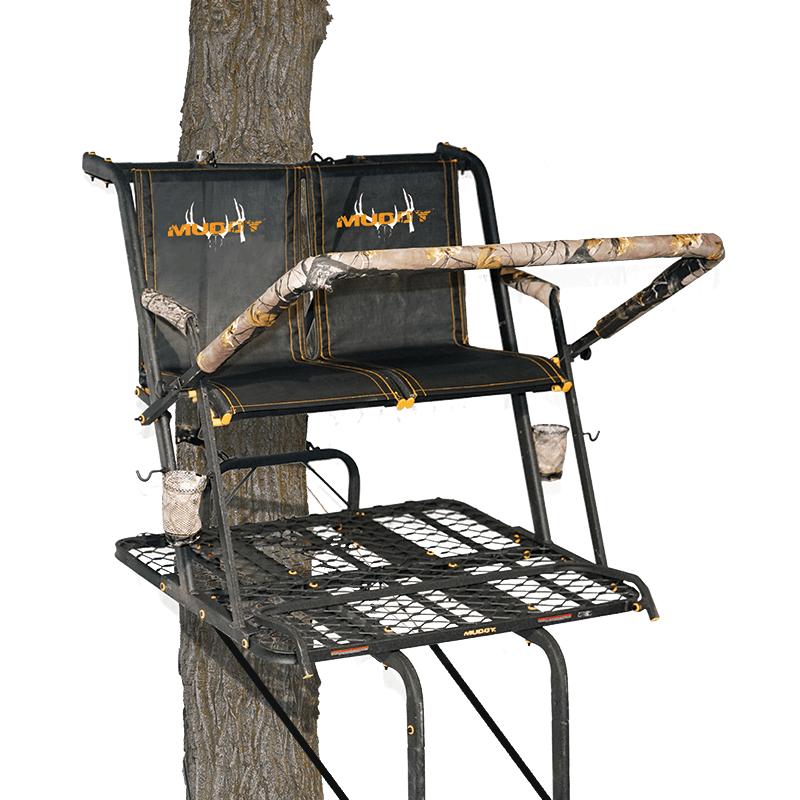 Muddy’s The Rebel 2.5 Ladder Stand delivers the back-soothing comfort and elbow room you need to take your shot. Adjustable, padded shooting rail on this spacious two-person treestand delivers a sturdy gun rest that can be easily flipped back for a clear bow shot. 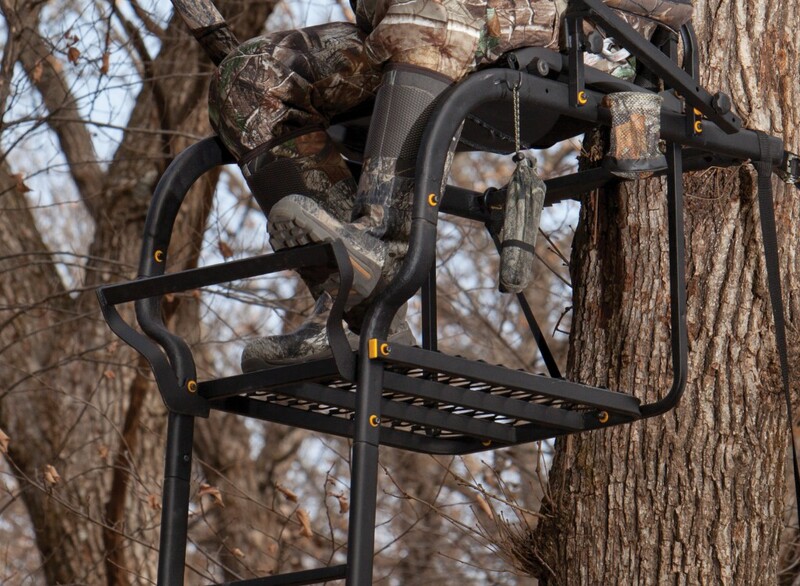 The Stronghold 2.5 XTL features the Hercules Cross Grip Safety System to secure your stand to the tree for confident climbs and prevent sliding. Fiber guard powder-coated steel delivers nonslip traction and protects against the elements. Orange nylon washers, spacers and caps shroud your movement in silence. Four single rail ladder sections with extra-strong oval tubing ensure steady stability. Ladder stands seem to be the most popular, widely used style of elevated tree stand because of the ease of use by any age or size of hunter. Ladder stands also give the hunter an option of single or double stands. Muddy Outdoors offers several models of both single ladder stands and double ladder stands. The double ladder stand offering is the Sky-Rise ladder stand, the Nexus, the Partner, the Prestige, and the Side-Kick. These double stands offer the perfect opportunity to take a friend or family member hunting with you. These also make great stands for youth hunting! Take a look at these double ladder stands here!